We will be featuring a new piece of furniture every month, to give you special access to limited savings! For the month of February, our potting benches are 10% OFF! Both the Deluxe Potting Bench and the Master Gardener’s Bench are on sale this month. This includes several variations to choose from: unstained, cedar stain and all three colors. Order yours at our website: woodcountry.com!! Potting benches provide the perfect workspace for any gardener. There are several factors that should be considered before purchasing any potting bench or garden potting work bench. First make sure that the bench is made of high-quality materials (like Wood Country’s kiln-dried cedar) and has a deep work area at the right height for you. You won’t want to have to stoop or reach up to work at the bench. One of the most important functions of a potting bench is to keep all your gardening supplies neatly organized in one spot. Make sure that you purchase one that has ample shelves above or below the workspace. Determine whether or not you will want to have a removable bucket that can hold potting soil or be used to collect extra dirt that falls from planter being repotted. Some benches have a handy raised wood edge that keeps the dirt from spilling and creating a mess in your backyard or patio. Check for sturdiness. A high-quality potting bench will last for years to come. A potting bench is the ideal spot for potting, repotting and other messy gardening jobs. Start your seedlings at this hand work station. Keep a garden journal, by writing notes on when plants were planted, what week your favorite flowers bloomed, and which plant you will want to transplant next spring. The bench top should provide a good solid surface to work or write. A garden potting work bench also is a great space to store hand tools, garden pots and to keep them within easy reach at all times. There’s never enough storage space in garages or on back porches. 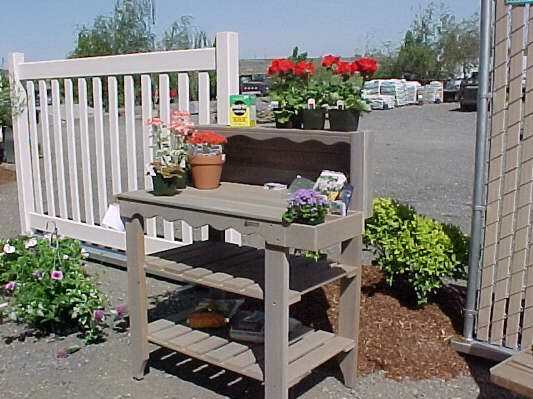 With a potting bench, all your gardening tools and supplies are at hand. Potting benches also provide a great surface for outdoor parties and a good place to store BBQ supplies. They’re not just for gardeners. Anyone who needs an attractive place to store supplies would benefit from a potting bench. While the backyard or patio is the ideal spot for any garden potting work bench, some people prefer to keep them in the garage for large shed. 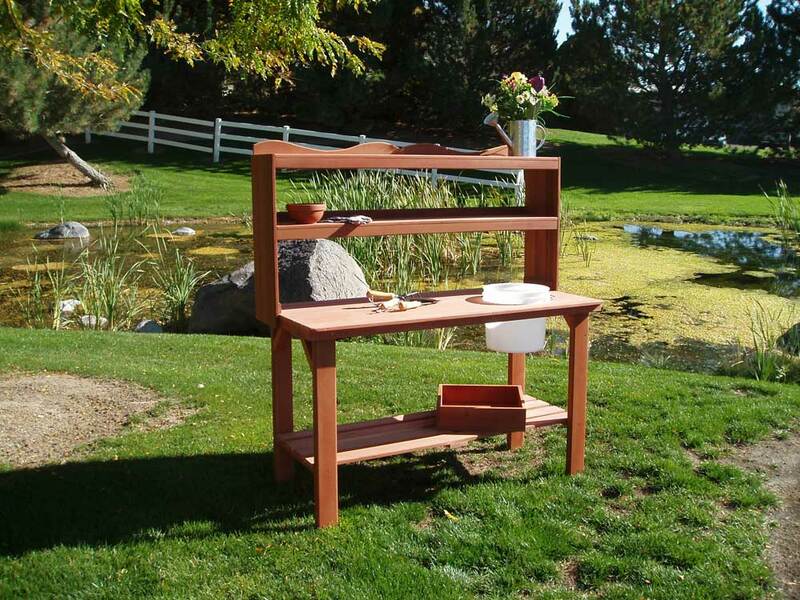 No matter where you place your potting bench, you’re sure to appreciate it. Always check manufacturer’s special instructions for cleaning and maintaining the specific potting bench that you own. In general, it’s a good idea to thoroughly clean the bench one or twice a season. Remove all supplies and use a hose to thoroughly spray off the potting bench and allow it to air dry. Or you can always wipe down the bench with a soft cloth. If you live in areas with harsh winters, it’s a good idea to store your potting bench in a garage or storage shed during those months. If that’s not possible, consider placing it close to the house and covering it with an outdoor furniture cover similar to those used for BBQ grills. Every gardener needs a good-size work surface and a place to keep tools and supplies organized. A potting bench is the perfect solution.